Worcester Solar Panel Hot water Systems. Have you ever considered the power of the sun to heat your hot water ? Have a Worcester Greenskies Solar water heating system installed and up to 70% of your annual hot water requirements could come to you entirely free. With fuel costs rising dramatically, solar energy makes more sense as every day goes by. IT is free, substainable, renewable energy from one of the most powerful sources of all. 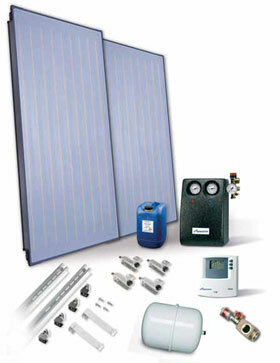 When you choose a Worcester Greenskies solar water heating system you will benefit from the reassurance and peace of mind that comes with dealing with an environmentally aware company that is part of the worldwide Bosch Group. Greenskies Solar panels do not require bright sunshine - just daylight. Can be used on a sloping or flat roof or even on a wall. Big savings on your hot water costs, solar energy is free! Great for the environment, solar energy is clean! 5-Year Warranty on solar panels plus 2-years on solar components.